Motorcycle charity quilt, a photo by capitolaquilter on Flickr. 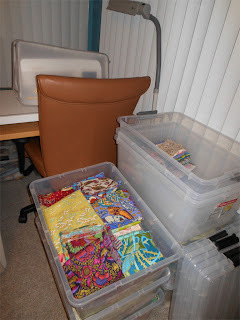 My sewing room redo feels a little like the saying one step forward and two steps back so it felt good to actually make some quilting progress this week. 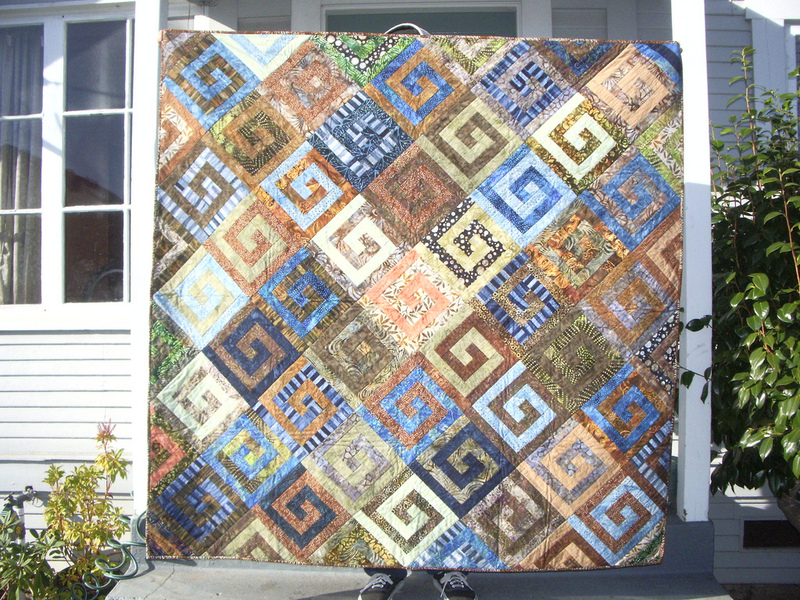 Here's the fourth and final quilt for the 31 Quilts in 31 Days SBAMQG charity drive. All of them are now basted and ready to FMQ on Friday's Sew Day. I'm going to take advantage of all of the fabulous tables that provide support for such a task and should finish in 8 hours since I'm planning to do a simple stipple. 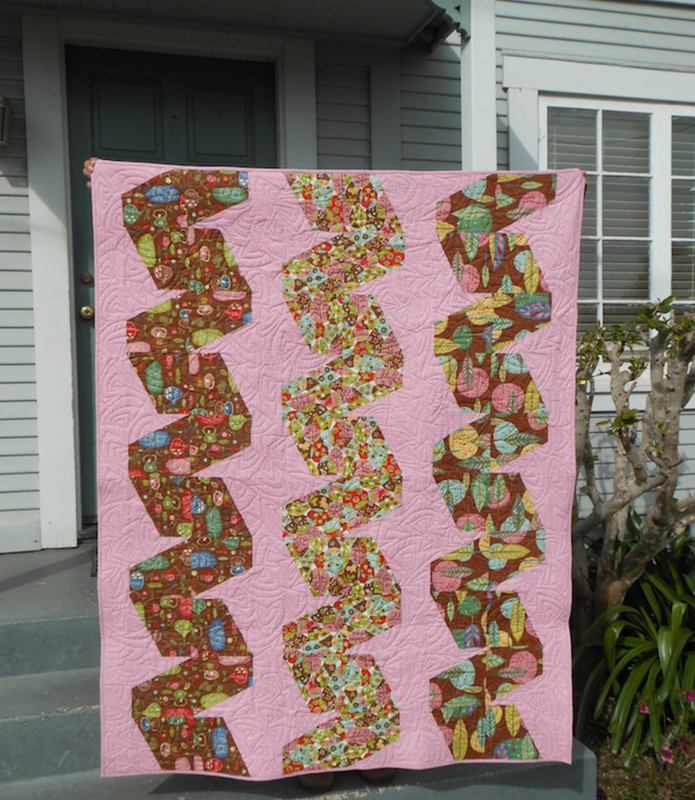 I'm giving myself a pat on the back - not because I made these wonderful XPlus blocks but because I thought to be Queen for the same month in both of my bees. The lovely ladies of F+F2 and MoStash get all the credit for these blocks and they just keep rolling in - yeah! Layout is going to be a blast. 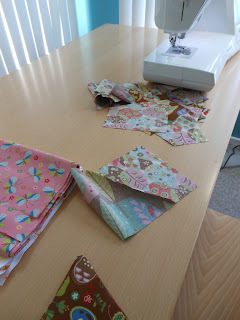 I've bolted almost all of my yardage and have a plan for the 1/2 and 1/4 yards. It was sad to put them back in the buckets but it's only temporary. 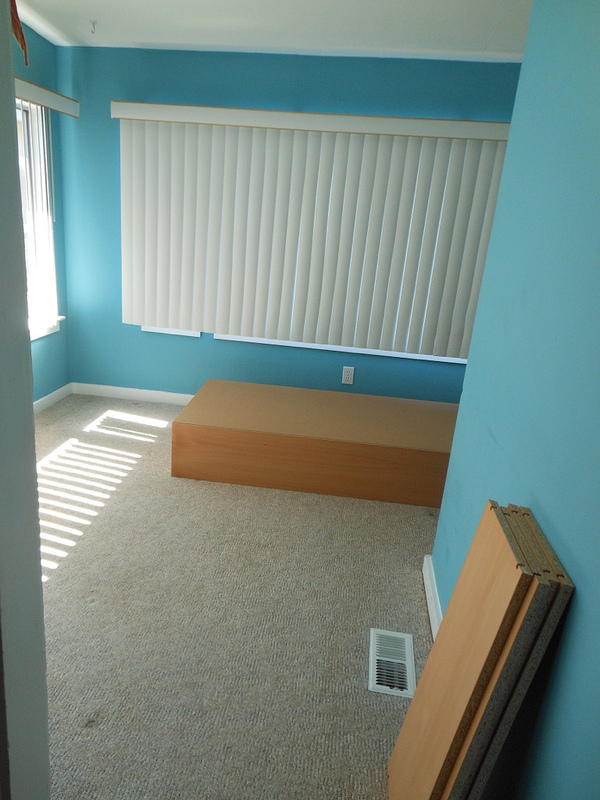 The bookshelf needs bolted to the wall. 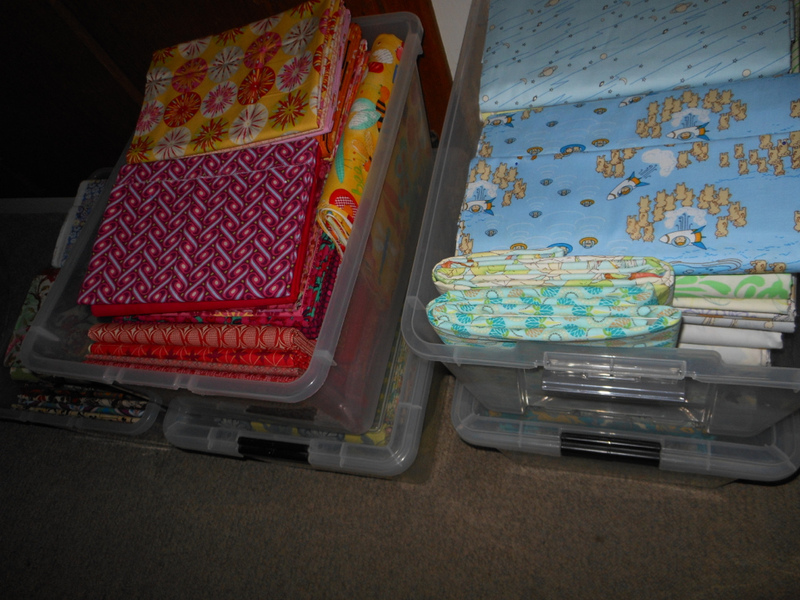 It will be easier to color sort them when it's time to put them back in - or so I am telling myself. The whole point of the redo was to reduce the clutter and make a creative environment. 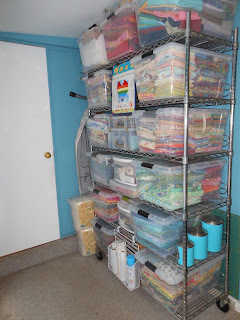 I have to keep reminding myself of that as I try and cram all of it back in here. "Edit" is the word of the day - or maybe "Acceptance". Happy to have finished up the final charity top and inking up to Finish it Up Friday. Check out all the amazing projects getting done. As I mentioned in a previous post, our SBAMQG is kicking off our newly formed Charity committee with an ambitious event: 31 Quilts in 31 Days - not just tops but bound, finished and given away. Last night I found the perfect flannel backing for one, an OK idea for piecing the backing of another and came up empty for ideas on the third. 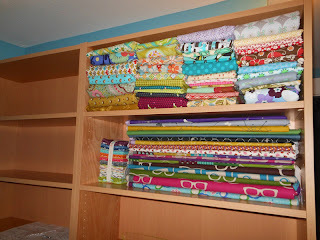 I've got to dig the buckets a bit more and am so looking forward to when my fabric is all organized on my new shelves. 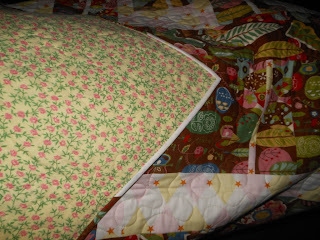 It was fun to bring the finished quilt from Sunday's workshop to share at the guild meeting on Monday night. 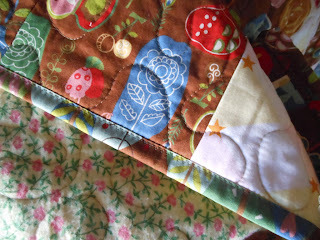 One of the gals sewed her swirl to the back of a jean jacket which was brilliant. I'm SO excited to get back to this technique before all of the hints and tips leave my head! 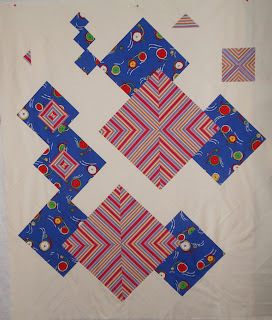 Because I had made a Greek Key log cabin before, this method of taking it up a notch wasn't totally foreign and when I made a mistake and skipped a color, Karin showed me how to insert the missed round - whew, glad there was a fix. 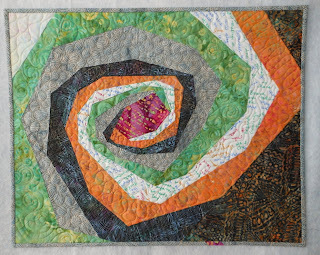 Happy to have Swirl done for the Linky Party at Finish It Up Friday with Crazy Mom Quilts and adding Tweet Tweet Two to the mid-month check in at ALYoF. 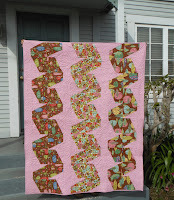 Have you seen Julie's new pattern Tunnel Vision? - love, love it.. and details are coming soon for a Mini-Modern Challenge Contest at Ellison Lane Quilts...So there you have it, my short-term and long-term goals. Linking up to WIP Wednesday with Lee at Freshly Pieced. I'm not on instagram and have a dumb phone but those of you normal people can check what she's been up to with her tiny paper-piecing bits. 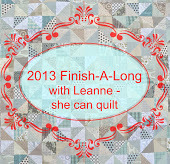 On the topic of goals and link ups - there are a few days left to post your FALQ2 list at She Can Quilt. - my 8 are there how about yours? Spiral - the beginning, a photo by capitolaquilter on Flickr. 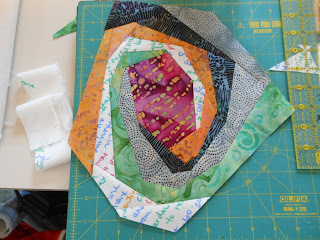 The Spiral workshop yesterday with Karin Lusnak was so inspiring and I really enjoyed her lecture at tonight's PVQA guild meeting not only about her quilts but her sculptures and perspective as well. I don't mind that the curve is jagged although I'm anxious to try again (and again) playing with the magical third cut that determines the swoop of the swirl. 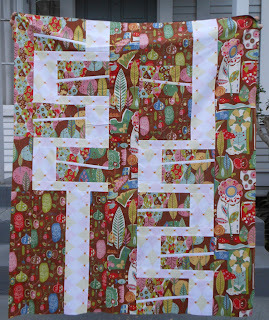 Creating our own personal text fabric was really unique and a great way to connect with the piece and process. Originally I thought I'd just choose a neutral background and fill around the shape I had made in class but then decided to continue the spiral. 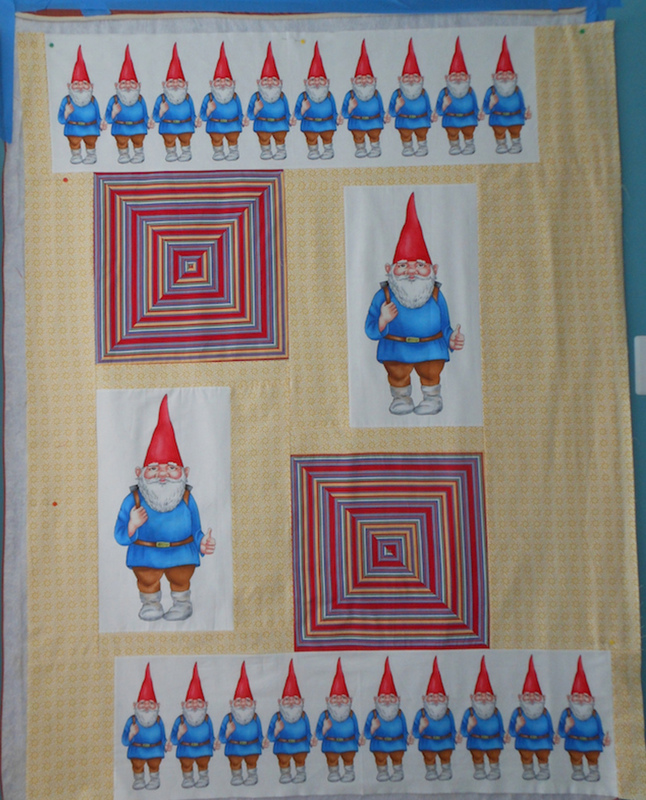 Blocking out my target size on the design wall helped tremendously. 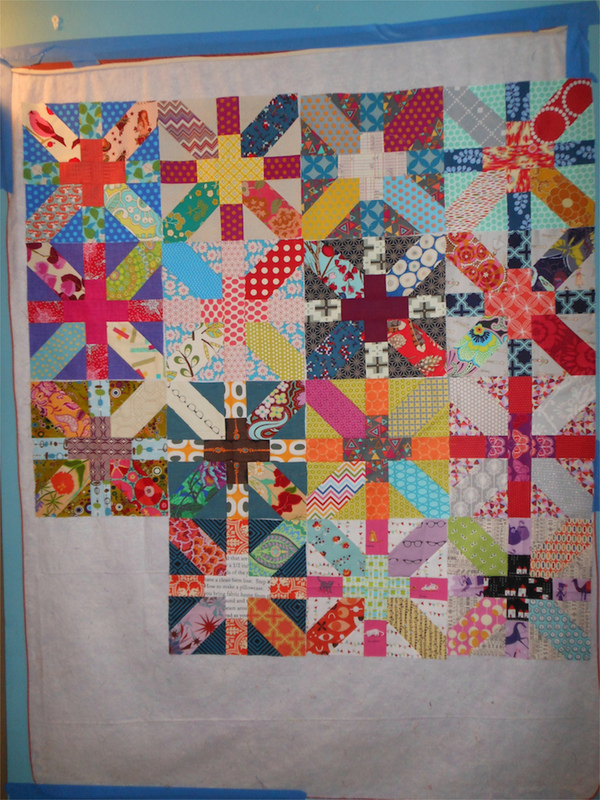 Finished size 21"x26" this will hang in my Sewing Room. 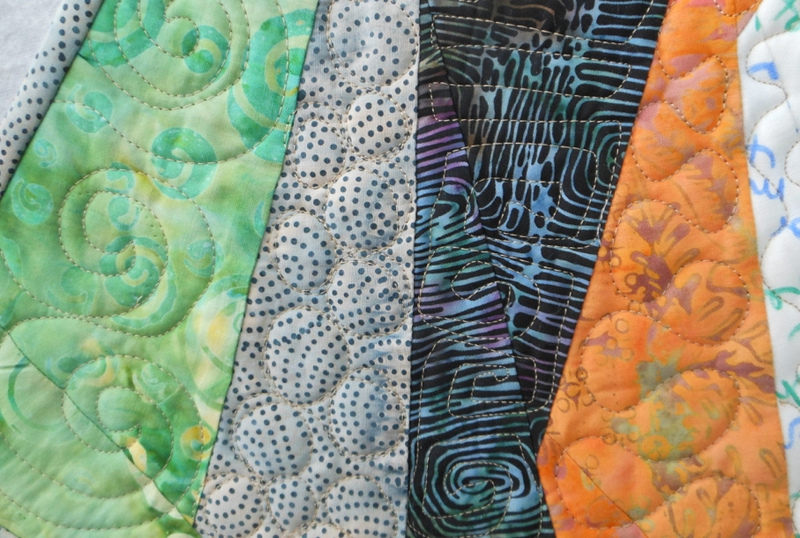 Each fabric has a different FMQ, swirls, bubbles, woodgrain... it got pretty tricky in the super narrow areas but I just kept going. 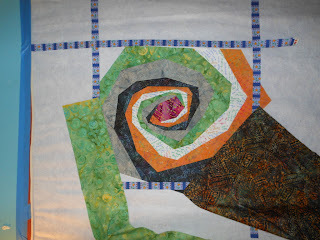 The center jewel fabric made an encore appearance in the binding. Endless options. No surprise... I feel an addiction coming on. FAL 2013 Q2 goal, a photo by capitolaquilter on Flickr. Decisions, decisions... here you have it, eight quilts for the FAL 2013 Q2 goal link up. 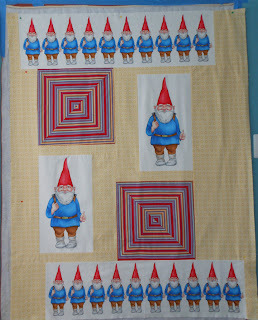 Quilts #1, #2 & #3 are all part of our MQG charity project so they had better get done. #4 Jigsaw is for my nephew's 21st birthday - in March - so it had better get done too! #5, #6, #7 were in my 2013 New Years Resolution mosaic and FAL will help me from breaking it... or so I hope. 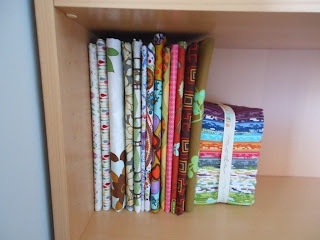 I'm sure I will get distracted and make other things along the way but it would be really nice to have these out of the way. It's funny how a quarter of a year can feel very long and very brief all at the same time. When I was thinking of what to include my mind went from "June is so far off, who knows what I'll be in the mood to work on"... all the way to "If the next 3 months fly by like the last, how will I ever get these done". We all have conversations in our head - right? Tweet Tweet Two, a photo by capitolaquilter on Flickr. Another charity quilt in the making. Mostly out of Moda's Tweet Tweet just like this one called Twist. 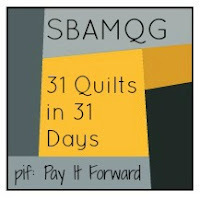 Our MQG charity committee PIF "pay it forward" is kicking off with a lofty goal of 31 quilts in 31 days for local children with cancer and I'm donating at least three. This time I'm really trying to let the design evolve. 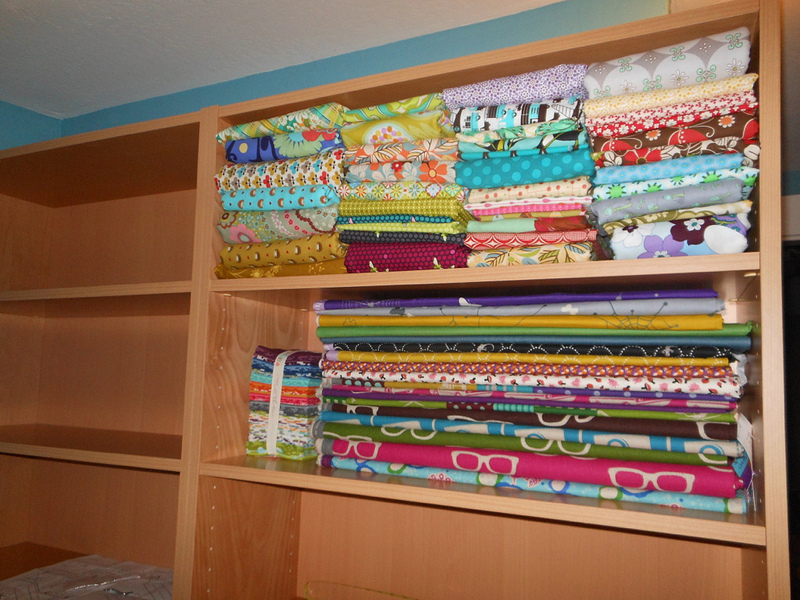 My design wall is down because of the Sewing Room redo (pictures below). 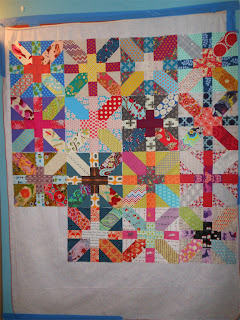 Even though I have a lot of putting back together of the space, I decided to drop everything and make a charity quilt. It's a little hard to find all my stuff but I'm making it work. I'm queen bee this month in both of my groups so the to do list is shorter than normal. Today I received my first xPlus block in the mail - fun stuff! 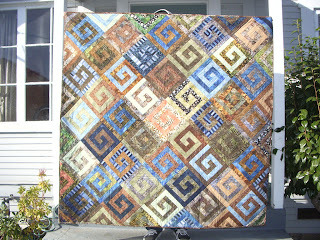 The link up for FAL Q3 FAL Q2 has a few more days and I need to make my goal mosaic so I don't miss the boat. Tweet Tweet Two will be on it of course and I'm using it as my April goal for ALYoF also.